The best known and most common is vanilla cream or with her name known crème patissière. 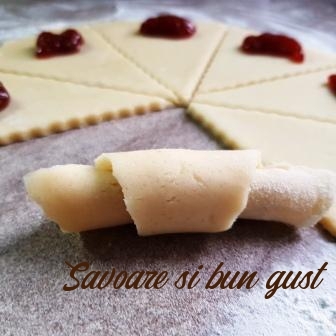 Vanilla cream use it successfully to fill Éclairs, Cremsit, we are using various toturi and we can make and the Apple pies or the famous croissants. Recipe Vanilla cream that I will cook today is inspired by the “culinary Bible” Le Larousse Gastronomique. Pull apart the vanilla seeds. In a saucepan with a thick bottom, pour 500 ml of milk, put the vanilla seeds. Hot milk with vanilla flavor, pour ⅔ of mixture over the eggs, stirring constantly with whisk. After we obtained a fine cream, pour over remaining milk in saucepan. Mix continue 2-3 minutes until cream thickens. Take the saucepan off the heat, remove the seeds of vanilla , cover with a foil food and leave the cream to cool to room temperature.